Logan Pierce clutched the brown leather satchel of government contracts as he disembarked from the train at the Darrow Falls depot. He had worked too hard obtaining signatures and promises of support to lose his work to a thief or gust of wind. President Abraham Lincoln may have declared war against the secessionists, but the U.S. Department of the Treasury had to find a way to pay for it. One more stop and he could return to Washington City, his assignment completed. Built on a rise of land, the train station overlooked the town. Stone and wooden buildings surrounded a town square bordered by trees. The bell tower of a church rose above the treetops on the northern end of the square. The tranquility of Darrow Falls on a warm summer day provided a pleasant contrast to the noisy chaos of Washington. Logan had left Washington City crowded with soldiers anticipating the first major battle of the war. 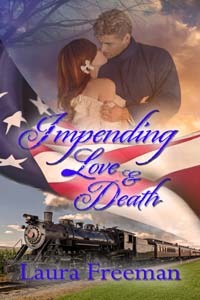 He’d almost missed his train eight days ago, entertained by the patriotic music of the bands and colorful parades of soldiers as they marched out of the city on the morning of July 16, 1861. He had been in Cleveland when news of the victory and then defeat at Bull Run on July 21 was announced. Accounts of the battle were in yesterday’s Cleveland Morning Leader, two days after the battle. The newspaper announced the victory in one column and next to it, told the story of how the battle had been lost. Once type was set, it was too expensive to remove, so both accounts were printed side by side in the same paper. Correspondents covering the battle called the men cowards. What had gone wrong? Logan tipped the man for his trouble and walked along the dusty road toward town. The Darrow Falls Inn was on the southwest corner of Darrow Falls and River Roads. The two-story building had an open breezeway with rooms on each side and a large wraparound porch facing town. Several men were seated at small tables, sipping coffee or smoking cigars. Across the street were the livery stable and a corral with half a dozen horses. He might need a horse to ride to Glen Knolls if the farm was more than a couple of miles out of town. Logan paused at Darrow Falls Road. A long row of businesses stretched along the west side of the street and faced an open town square where sheep grazed. More shops lined the far side of the square. A few buggies and horses were tethered along the square under shade trees. Wheeler’s dry goods store was across the street on the opposite corner. Logan strolled toward the store. He didn’t hear the buggy bearing down on him until the horse snorted a last minute warning. He leaped to the side, dust billowing from the impact when he hit the ground. He coughed to clear his lungs and stood, brushing the dirt from his black wool suit. The frock coat reached midthigh on his tall frame. He tugged on the black silk vest and made sure his watch wasn’t broken. Then he gathered his top hat, satchel, and searched for his attacker. The driver had stopped at a hitching post opposite Wheeler’s store. Logan headed for the buggy. The reckless ruffian needed to be more careful. The driver stood, and her pale yellow skirt billowed out of the rectangular box that formed the structure of the buggy frame. She retrieved something from the padded bench seat and bumped her wide flat straw hat on the canopy designed to protect occupants from the sun or foul weather. The woman shouldn’t be allowed behind the reins of a horse. The backside of her crinoline skirt wiggled, and the long ties dangling from a large blue satin bow tied around her waist echoed the motion as she searched for the metal step on the side of the buggy. She stumbled and screamed. Logan dropped his satchel and caught her around the waist. His hands nearly encircled the tightly drawn corset beneath the sheer cotton dress. Small blue flowers were scattered on the field of yellow fabric. He eased her to the ground. Her oversized bonnet tied with a matching blue satin ribbon had fallen forward and covered her face, but her exposed hair was a subtle blending of bronze and copper in the sunlight. The colorful strands reminded Logan of fire, both beautiful and dangerous. Her hair was worn in an intricate knot of braids with yellow and blue ribbons woven among them, matching the colors in her dress. Logan’s hands remained on her small waist. She trembled beneath his touch. Her crinoline was caught on the step she had missed before her tumble, and her skirt was hiked in the air. She struggled to free the bottom wire that formed a bell-shaped support for her skirt. “Allow me.” Logan extended his arm around her. He glanced at the shapely legs in white stockings before plucking the hoop from the step. She raised her bonnet and stared. “I don’t know you.” She had cool blue eyes with long dark lashes. A sharp contrast for a fiery redhead. Her pale skin blushed beneath his gaze. “Logan Pierce. Rescuer of damsels in distress.” He removed his stove top hat and bowed before retrieving the satchel he had dropped in order to catch her. “I arrived on the train,” Logan said. Jem Collins refused to reply. The man’s rudeness was unforgiveable. Logan may have been dressed like a gentleman in a long coat and matching trousers, but he lacked any manners. He smoothed blonde bangs away from an angelic face, the fine lines of his nose and jaw etched by a skilled artist. He must be wearing a disguise. He opened the door to the store. “If I am, then you don’t exist.” He proceeded inside ahead of her. Jem removed her gloves and chose a smashed tomato in a tin bucket by the door. “Miss Jenny, that tomato is rotten,” Marcus Wheeler announced. Logan swirled around, his cinnamon eyes wide, and maneuvered his hat in front to block any throw. “And you believe she was more than a pretty ornament?” Sarcasm dripped from every word he spoke. Jem gasped, turning her back to him. She surveyed the merchandise, her eyes adjusting to the shadows and bands of light streaming through the sectioned window. A sewing machine was on display along with a set of hand-painted dishes and lace trimmed tablecloths. Less expensive pots and pans hung from the rafter beams. Yard goods were stored on shelves along with scissors, thread, and needles. Barrels of salt and wheat flour crowded the floor. A sign advertising granulated sugar for eight cents a pound and rice for seven cents a pound was placed near the scale. “No.” Jem didn’t explain why she had hurried to the store. Ben always wrote his letters on Sunday and mailed them early Monday. Sometimes she received them on Tuesday but nearly always by Wednesday. Ben’s last letter had been dated July 14, 1861, two days before the troops marched out of Washington. His next letter was due today. The door opened, ringing the bell in its path. Matt Wheeler carried the mailbag inside. Matt was an awkwardly thin boy of fifteen but strong in spite of his appearance. The boy dumped the contents on the counter. Marcus sorted the mail and deposited the letters in the proper slots marked for each household. “That’s good news.” John’s letter to his mother had arrived. So where was Ben’s letter? She waited as he finished sorting. Nothing from Ben. The weekly paper usually had fiction stories and poetry on the front page. Any news story was on the second page and at least one week late if not longer. Jem opened the folded newspaper printed Tuesday, July 23, 1861. She may have to rethink her opinion of Logan Pierce being a rude, obnoxious ogre. Jem stood near the window reading the report of the battle near Manassas railroad junction. Under a column labeled “Telegraphic,” the heading announced Our Great Victory. In the adjoining column, the heading announced Fearful News followed by OurArmy Forced Back. The Battle of Bull Run had turned from a morning victory to an afternoon disaster. The story had no news of the First Ohio. It concentrated on the retreat. “Panic was so fearful that the whole army became demoralized, and it was impossible to check it either at Centreville or Fairfax Court House,” she read. “The porter gave me five cents,” Matt said. Marcus signaled Matt to carry Paula’s larger packages. Logan opened the door for them. His manners hadn’t improved. She turned her back. “Miss Jenny can show you the way to Glen Knolls,” Marcus said. “Her sister is married to Tyler Montgomery and lives at Glen Knolls,” Marcus explained. Jem had reached the middle of the street when a hand cupped her elbow. Bath — New recruits and visitors were tested by the heat and rain during the Civil War reenactment Aug. 13 and 14 at Hale Farm and Village in Bath. More than 700 participants reenacted the Battle of Big Bethel, one of the earliest American Civil War battles, which occurred in June 10, 1861. The Battle of Big Bethel was the first land engagement in Virginia, and the Federals were overconfident, said Mike Church, commander of the 6th Ohio Volunteer Cavalry. The Confederates used breastworks and their cavalry to beat the North. The battles on Saturday and Sunday demonstrated the role of the Cavalry in the war, he said. “We want to educate the public,” Church said. For those who remember, last year Southern General Robert E. Lee surrendered to Union General Ulyssses S. Grant at the Appomattox Court House, and the battles celebrating the 150th anniversary of the Civil War came to a close. Many of the veterans waited until the end of 2015 to retire and the reenactors are looking for new recruits, said Bob Vance of Jamestown, Tennessee and deputy commander of the 6th OVC. Church, who is originally from Parkersburg, W. Va., and now lives in Kentucky, said members come from every state and two are from Canada. The 6th Ohio Volunteer Cavalry is the largest in the United States with 68 riders, Church said. More information is found on the 6th Ohio Cavalry Facebook site. Riders typically provide their own horse, and the horse has to be trained to ignore the cannon blasts and gunfire during a battle, he said. Riders also need to be trained to understand the bugle calls, which the 6th OVC uses to communicate commands, Church said. Troopers in the unit come from all walks of life and participate in six to seven events a year but form a community, he said. The riders use a McClellan 1859 style saddle made of wood and rawhide, said trooper Brandon Parchman of Nashville. A rider’s equipment includes the saddle, bridle, saddlebags, nosebag with oats, a carbine, canteen, haversack and bedroll. Parchman wears a saber, weapons belt, revolver and wool uniform. The Camp Chase Fifes and Drum Corps provided period music; and reenactor leaders included Brigadier General Bob Minton of the First Federal Division; Colonel Greg Van Wey of the Jeff Davis Rifles Battalion; and Colonel Paul Baltzer of the Birney’s Division. Besides the battle and camps, visitors could tour the permanent buildings at the village. The “Old Brick” house, home of Jonathan Hale, was completed in 1827 with three generations of Hales living on the farm. Since 1958 Hale Farm & Village has been preserving and interpreting life in the Western Reserve. Ashleigh, 7, and Noelle, 5, Cenna learned the process of taking wool from the sheep, carding it and spinning, which was demonstrated by Hale Farm & Village employees Lauren Fowkes and Megan Smezink. Fowkes, who has a degree in communication and theater, said she has a passion for history. She said in a time when people are glued to social media, they need to see people interact directly. “A Red, Red Rose” by Susan Coryell is written in the voice of the heroine, a twenty-year-old wannabe writer and sounds authentic as she struggles to understand the mystery surrounding her family and whether or not the strange happenings are due to a ghost or a vengeful relative. The story is told in first person, and the “I saw” and “I thought” were a bit heavy handed in the beginning but were less noticeable later on. Detailed description helped to create the setting of a Southern plantation, and the characters were interesting and likeable. The plotting was steady with a tense-filled climax. I would recommend the book for anyone who likes romance, a cozy mystery or a Southern Gothic ghost story.